What is Movie To GIF? 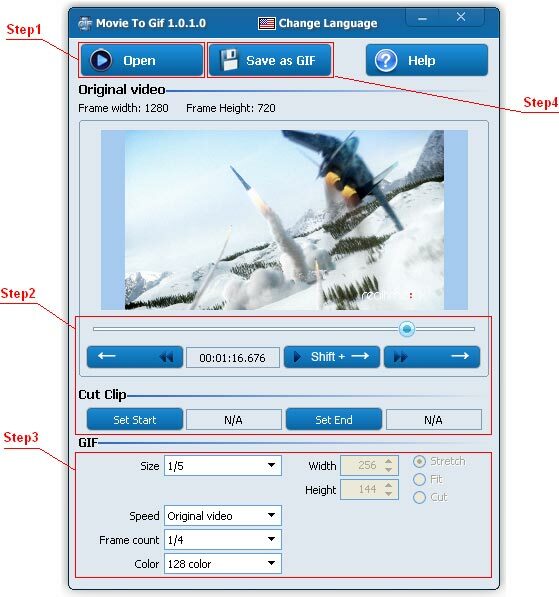 Movie To GIF is a fun application designed to turn video clips into animated GIF clips in a few simple steps. How to get animated GIF from video. Step 1: Click the "Open" button to open an video file. Step 2: Drag the progress bar button or click buttons (→ ← shift+→) to set the start or end position, then click “Set Start” or "Set End" button. Step 3: Set GIF options. You can set GIF size the same as the original video file size or smaller, or create a custom GIF size. Also you can set the animated GIF play speed and the frame count as well as the colors. Step 4: Click the “Save as GIF” button to save the clip as a GIF file. Copyright © 2008-2018 zxt2007.com Corporation. All rights reserved.